We're used to toys based on movies, based on TV shows, based on comics, based on cartoons, based on videogames, even toys based on toys... but what we're not used to is toys based on novels. King Kong is easily the most famous gorilla in the world. Fillmaker Merian C. Cooper had a lifelong fascination with gorillas, and one day in 1930, he heard a rare sound: an airplane flying over midtown Manhattan. Looking up, he immediately conceived of a giant ape climbing the world's tallest building. A few months before King Kong released in theaters, an official novelization of the screenplay was released. 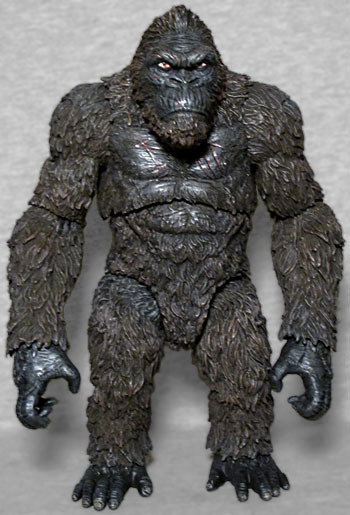 In 2004, artist Joe DeVito began working with Cooper's estate to write an official sequel to that novelization, called Kong: King of Skull Island; in 2017, he took to Kickstarter for another sequel, the somewhat-confusingly named King Kong of Skull Island; that Kickstarted novel is the source for this figure. 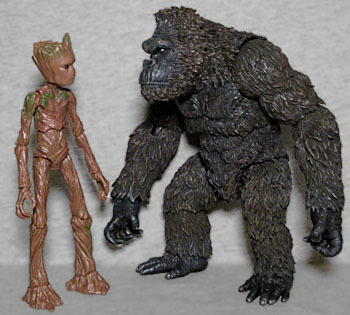 In the original movie, Kong's height varied widely - intentionally. On Skull Island, the sets made him look 18' tall; in New York, that was closer to 24', and eventually 60'! The special effects artists tried their best to keep things standard, but Cooper was more interested in what looked coolest in any particular scene. An 18' ape, for instance, would have been nearly invisible at the top of the Empire State Building. This toy stands approximately 7" tall, so how tall he really is will determine what scale you want to call it. We're saying 1:36, or a 2" scale. So not impressively giant, but hey, if you know anybody who can sew, you could turn this into a Marvel Legends Ken Hale Gorilla-Man. King Kong is not an actual (oversized) gorilla, so his anatomy is different. For instance, he doesn't have a gorilla's big gut, because he's an omnivore and thus doesn't need to consume huge quantities of vegetation. The hands are also more human, and the posture is upright. His fur is sculpted with thick details, while the scars on his bare chest show the evidence of a lifetime spent fighting vicious enemies. The proportions and styling come straight from Kong: King of Skull Island's sketchbook section. Also straight from the art? The two heads. You get your choice of open or closed mouths, but they both look fearsome, with heavy, knit brows over intense eyes. When we can see his teeth, they're huge and pointed, but even when we can't, he still has a disinviting frown. The head is mounted on a large balljoint, and is easy to swap - though the tuft of fur pointing forward off his forehead can jab you in the hand pretty good. Actually, that can happen even when you're not changing heads. All the joints are surprisingly stiff, which means you need to get a nice tight grip on the figure in order to move it. 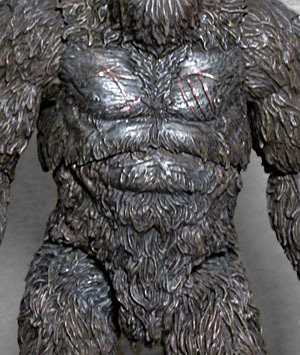 As we said, Kong isn't technically a gorilla, so you don't have to worry about trying to pose him on all fours. The toy moves at the ankles, knees, hips, chest, wrists, elbows, shoulders, and head. Everything is either a balljoint or a swivel/hinge combo, so there's plenty of potential, it's just hard to get them moving. Better that than loose, floppy joints though, right? Finally, we get a pair of shackles that feature real metal chains and actually clasp around his wrists. The chains aren't very long, suggesting they've snapped off the harness that was holding him on display. Cool idea! And since they're functional, you have your choice of "in the wild" Kiing Kong or "on the run" King Kong. There's also a Previews-exclusive black-and-white variant that includes a few extra Kong bones as a bonus. It would have been pretty neat if they'd included a biplane for him to swipe at, but there's no way the scale would have worked. Maybe the Transformers 2 Ransack figure would work for him. 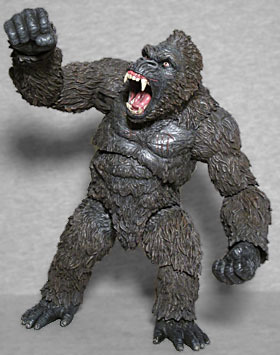 Mezco had the King Kong license back in 2005 when Peter Jackson's movie came out, but that figure was really hard to find and was a mostly unarticulated rotocast figure. Bandai made one for SH Figuarts, but it shot up in price in no time. 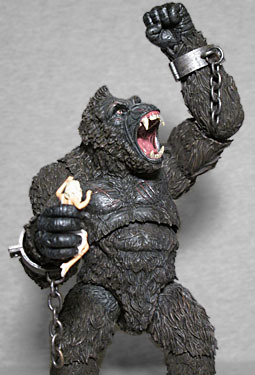 There was a vintage King Kong in Movie Maniacs Series 3, but, well... McFarlane Toys. You get it. And of course, Lanard had the license for the most recent movie. So really, this Kong is the best one around, in terms of design, cost, and availability. 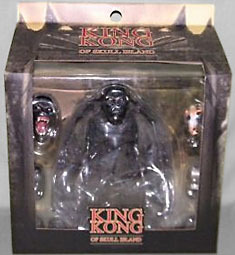 $40 feels slightly high for this figure, especially since it's effectively been shorted two accessories (unless you get the exclusive), but if you want the most famous ape in the world, this is the one to get.